Kansas City's industrial market remains strong, with more than 3 million square feet of speculative space currently under construction and 1.3 million SF completed in the first quarter. But in order to succeed in the rapidly changing, omni-channel marketplace, communities and companies need to remain flexible on all fronts, ranging from operations to incentives to workforce development. That's the consensus of panelists at KC SmartPort's 2019 Industry Briefing, FLEXKC. "While the economy and most indicators point to continued growth, the need for companies to increase flexibility in operations and hiring practices has never been greater. That is true of how companies build, use and occupy space as well,” said KC SmartPort President Chris Gutierrez. One of the next waves in industrial development will be "Food on Demand" as consumers seek convenience and freedom from the kitchen. That means cold storage facilities are landing at the top of the shopping list for those scouting industrial locations. "We are seeing an uptick in that sector," said Colby Tanner, BNSF Railway assistant vice president. "Over the last 18 months we have started to get a lot of inquiries from the cold storage sector asking how can we locate along the rail line or have rail access." Although they come with significant investment and a subsequent boon to local coffers, cold storage facilities can present a challenge when it comes to incentives. "These are really high-dollar projects, but they require a non-traditional workforce. So from an incentives perspective, you have a project with a huge investment but the challenge will always be workforce,” said Ann Petersen, Cushman & Wakefield managing director. Other barriers to entry include higher insurance costs, environmental impacts, and margins squeezed by waste. "Food on demand is a challenging business, " observed longtime Amazon Site Selector and Keynote Speaker Mike Grella. "I think there’s room for growth there, but we are still in a period of experimentation and iteration." For a full event recap, click here. The vacated Toys R Us Kansas City distribution facility in Lee’s Summit made national headlines when the retailer folded in early 2018. However, brisk demand for large, tenant-ready industrial space meant that the property sold quickly. More than two dozen potential buyers toured the 725,000-square foot facility at 420 SE Thompson Dr. near U.S. Hwy 50 and Mo. 291. Coincidentally the first company to come calling, Mid-States Distributing LLC, emerged as the winning bidder for the 41-acre property. The leading farm and ranch retail store cooperative plans to invest more than $35 million in the distribution center, which will service a network of 39 member companies and nearly 700 retail locations in the U.S. and Canada. Mid-States will commence operations in the facility by the end of the year with immediate plans to hire between 30 and 35 employees within the next month to launch the operation. Lee’s Summit Economic Development Council President Rick McDowell said the high level of interest in the former Toys R Us space signals ongoing strength in the warehouse and distribution market and room for more activity in south Lee’s Summit. NorthPoint Development officially broke ground Wednesday morning on Southview Commerce Center, a 148-acre flex industrial campus at 16001 S. Outer Road just east of Interstate 49. At full buildout, the redevelopment of the former Southview Golf Course will create an estimated 1,400 jobs with an annual wage impact of $57 million. “NorthPoint continues to expand its footprint in the Kansas City industrial market and we are pleased to announce our newest business park, Southview Commerce Center. This project shows our focus on investing in parks with great access, labor, and a strong public/private partnership like we have with the City of Belton,” said NorthPoint Development CEO Nathaniel Hagedorn, in a release. Belton Mayor Jeff Davis noted NorthPoint Development’s success in helping transform communities through the development of quality business parks and thanked the development team for bringing its vision for the abandoned private golf course to the City. Southview Commerce Center is master-planned for five state-of-the-art buildings ranging from 235,000 to 622,000 square feet, for a total footprint of more than 2 million square feet. The project’s construction timeline will be market driven based on leasing activity. NorthPoint plans to invest more than $100 million in the redevelopment project. 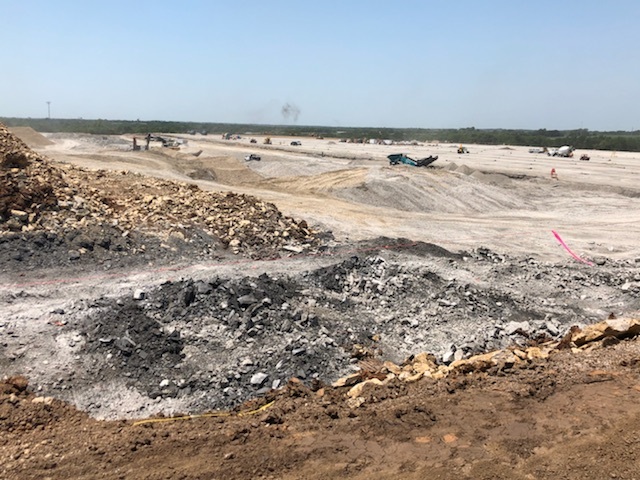 At the groundbreaking, NorthPoint Vice President Brent Miles credited the persistence of Belton Economic Development Director Carolyn Yatsook for NorthPoint’s initial interest in the site. Yatsook said the City has worked hard to create a business-friendly environment that allows developers like NorthPoint and business prospects to have an expedited, hassle-free experience as they move through the approval process. Mark Fountain of True North Industrial Realty will lead leasing efforts for Southview Commerce Center. New Jersey-based Metropolitan Warehouse & Delivery is expanding into the Kansas City market, leasing 20,000-square feet at 3518-3522 Enterprise Dr. near Interstate 435 and Interstate 70. Metropolitan Warehouse & Delivery offers "white glove" in-home delivery and packaging of high-end furniture and antiques and works with retailers Costco and Restoration Hardware. The company has an estimated 2 million square feet of warehouse and distribution space under lease nationwide, including facilities in Wichita, Denver, and Dallas. "The Kansas City lease rounds out the company's Midwestern footprint," said Ben Boyd of NAI Heartland, who represented Metropolitan Warehouse and Delivery in the transaction. "They try to set up distribution hubs every 200 to 300 miles, and proximity to the I-70 trucking corridor is obviously very strategic." Metropolitan Warehouse and Delivery took occupancy of the building at Stadium Industrial Park Sept. 1. Mark Fountain of True North Industrial Realty, LLC represented the landlord in the transaction. "I believe that as more and more companies develop their 'last mile' strategy, they will find that Stadium Industrial Park is an ideal location," Fountain said. Kubota Tractor Corporation has completed a 200-acre land purchase within Phase II of Edgerton's Logistics Park Kansas City, making the company the first major tenant for the industrial park. Kansas Gov. 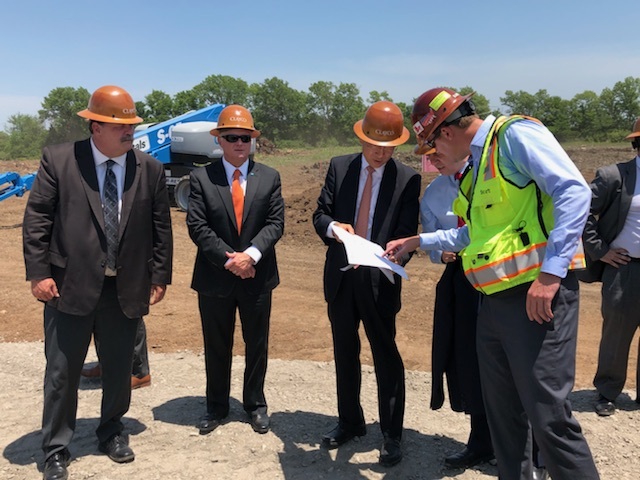 Jeff Colyer and Kubota officials on Thursday toured the site where Kubota will construct two, one million square-foot, state-of-the-art logistics facilities for its new North American Distribution Center (NADC). 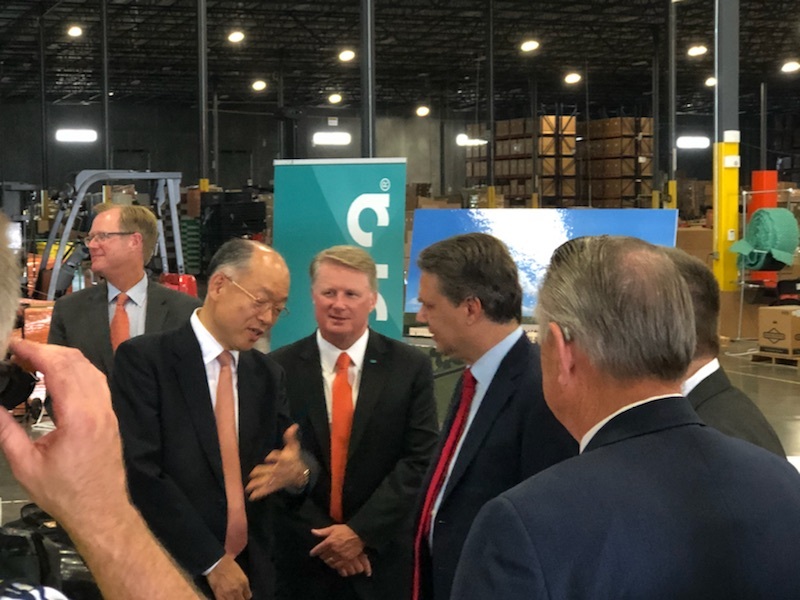 The move signals Kubota's intention to plant solid roots in Kansas to expand distribution capacity and streamline logistics processes for the timely delivery of its branded service parts and equipment to the U.S. market. Kubota first leased space in Logistics Park KC in 2015 with a 765,000 square foot facility, and offered increased access to its 1,100-strong dealer network. That building, which employs 150, will remain in operation and continue to be the source for Kubota parts and equipment for worldwide export until the new facilities are complete. “Kubota has been an ideal leasing tenant, and we are thrilled to welcome them as our newest neighbor as they fully integrate into the local community. The central proximity of Edgerton within the U.S., and its world-class inland port and intermodal facility, give companies like Kubota direct connections to the global supply chain and the ability to quickly and efficiently ship goods by rail and truck to their final destination," said Edgerton Mayor Donald Roberts. "Edgerton and our partners have a proven track record of thoughtful planning and significant investment in infrastructure attracting businesses to Edgerton and growing our local economy." With 150 employees already in Edgerton, Kubota's expansion will add more jobs to the area as well as expand the company's 1,500-employee Great Plains operations in Salina. "Kubota’s continued investments in Edgerton makes it one of our state’s greatest business success stories,” Gov. Colyer said. “Today’s announcement is a testament to the company’s commitment to continue strengthening the state’s manufacturing and logistics base and creating future job growth. We thank Kubota for believing in the potential of our state and investing in the future of our residents." 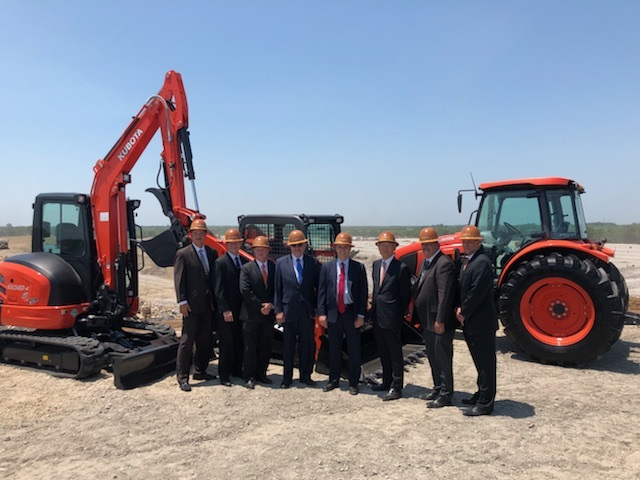 Once complete, the new facility will allow Kubota to continue to receive and process shipments from Asia and Europe, in addition to goods from suppliers in North America, with more capacity and with accelerated shipping speed for the timely delivery of Kubota parts and equipment. 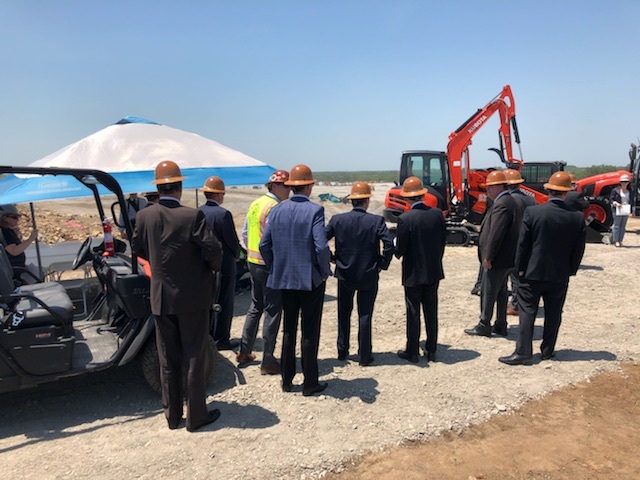 “Kubota will anchor the expansion of Logistics Park Kansas City, and NorthPoint is proud to continue our more than four-year partnership with the company to see their future plans come to fruition here in Edgerton,” said Patrick Robinson, NorthPoint Development. Check out photos below from Gov. Colyer's site tour and official announcement. Click to advance the slideshow.